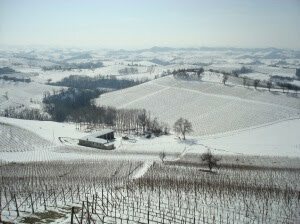 The hills of Barolo may be covered in snow this coming Sunday, but in San Diego it looks like we'll have weather in the mid 70's! No wonder everyone I talked to in Piedmont said they loved San Diego. This Sunday, March 28th, we will be hosting a fantastic Piedmont wine tasting from 5-7pm on our patio. Helping us out will be italian wine experts Jeremy Parzen Ph.D.(Austin) and Whitney Adams(L.A.) of blogs Do Bianchi and Brunellos Have More Fun. Both are great reads if you haven't already checked them out. Whitney and Jeremy were also part of a blogging/wine trip to Italy I recently returned from covering the Barbera Meeting 2010. 2007 Cantine Valpane Barbera Del Monferrato "Pietro Rosso"